Cloudy Sunday so went to see Meryl Streep and Rick Springfield in, Ricki and the Flash. I had a ball…maybe it was the oldies, but it sure was a pleasant way to spend a Sunday morning. We met our daughter, Courtny in Santa Monica at Ox & Son for brunch with the doggies. Ox & Son is a winner. As we settled in, my daughter told me that Frank Gifford had just passed away. You just never know how news of someone’s demise will affect you. I couldn’t swallow and tears came into my eyes. 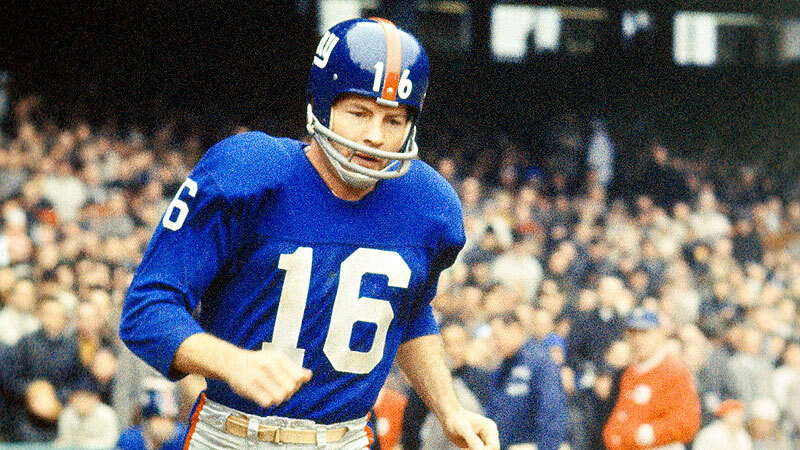 Not only was #16 an amazing wide receiver (flanker), halfback and defensive back for the NY Giants and my favorite player, to boot, but he was such a kind and lovely gentleman…a real class act. He was the face of the Giants franchise for years. My family has owned Giants season tickets since the 1950’s, I used to attend as many NY Giant events as I could. I frequented them even before I became a besotted teenager. At the Giant happenings, Gifford would go out of his way to chat with me. I was always the only girl at these events. He even signed an official #16 jersey for me which I still treasure. Other than Tom Brady, no one looked as good in a football uniform. My dad knew many of the NY Giant players. In the dark ages, football players did not make much money and, out of financial necessity, many had jobs in the off season. 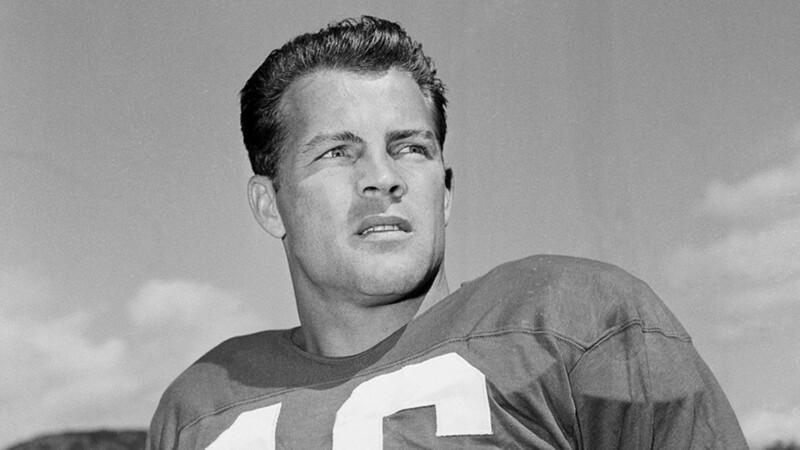 Frank Gifford was the NY Giants #1 draft choice in 1952 out of USC. Gifford was offered $7500 to sign. He held out, eventually signing for $8200. Andy Robustelli, a Hall of Fame defensive player for the Giants, was a great family friend and was well aware of my Giant obsession. In fact, I went to elementary school with family members and IF the Giants lost on a Sunday, Monday morning, Mrs. Kaufman, my 6th grade teacher, would warn the class not to tease us because we took the losses to heart. In later years, Andy Robustelli was afflicted with Alzheimer’s Disease and Gifford would go to his house every week to visit with his good friend. I remember watching one of the most vicious hits ever in football put on Frank Gifford. On Nov. 20, 1960, the Eagles battled the NY Giants with first place on the line in the NFL’s Eastern Division. With the Eagles leading 17-10 in the fourth quarter, Gifford caught a pass and attempted to get to the sidelines. He never made it because he, unfortunately, ran into linebacker, Chuck Bednarik, who leveled him. Gifford fumbled. 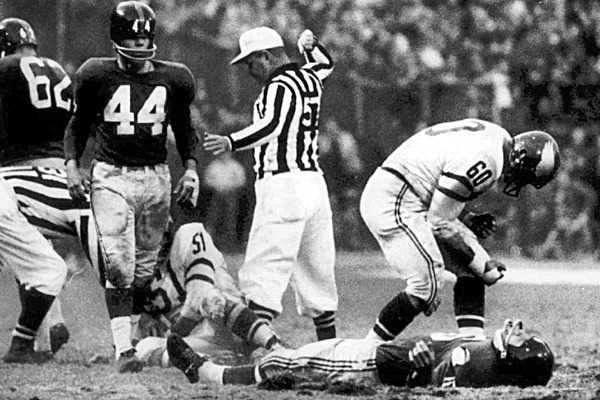 The Eagles recovered and Bednarik celebrated, apparently not realizing that the hit had left Gifford lying on the field, suffering a severe concussion that cost him the rest of the season and the entire next season. Well, I was appalled so I sat down, took out my crayons and lined paper and wrote a letter to Bednarik with my mother’s help. I felt vindication for #16. Unfortunately, all I got back was a stinking autographed photo which I burned with parental assistance. I never forgot that hit. 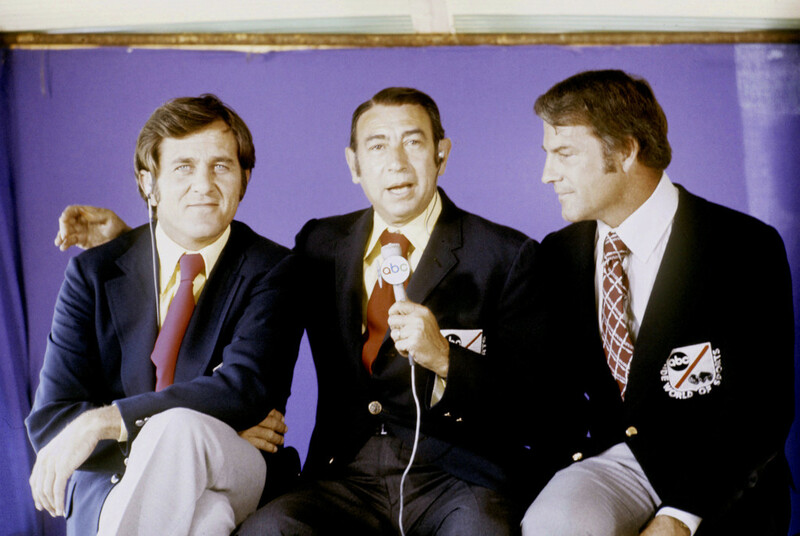 When I worked at ABC Sports, Frank was an integral part of the Monday Night Football broadcasting team (1971-1998), part of the raucous triumvirate of Howard Cosell and Don Meredith. In fact, Frank Gifford even came to my rescue during that period. One of the ABC Sports college football announcers was inappropriate and locked me in his office with evil intent. Not being shy, I screamed my lungs out and Frank Gifford broke down the door and saved this damsel in distress. When I was on my to live with Mrs. Robert Kennedy, I flew down to Washington with Frank’s teenage daughter, Vicki. At dinner that night she met her future husband, Michael Kennedy so our paths crossed again. 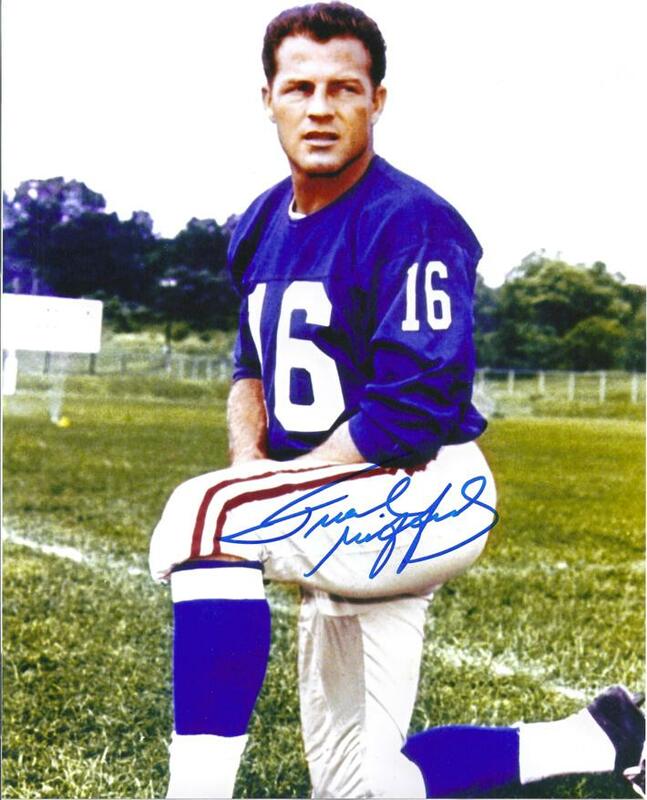 We lost a Giant of a man and a hell of a football player this past Sunday, the day of the week that Frank Gifford was always a hero. He seemed like a very nice guy in real life. Heard he was well liked by almost everybody. RIP Frank. And thanks for sharing!